So it’s all over and descended into absolute chaos, but is it really that suprising? 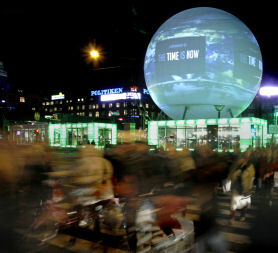 It wasn’t only inside that things started to take a turn for the worse last week, as talks stalled police and activists clashed on the streets surrounding the Bella Centre in Copenhagen. It now transpires that China chucked the largest spanner in the works and is getting most of the blame for the demise of COP15, alongside America who according to Gordon Brown, showed a lack of ‘ambition’. Without the superpowers agreeing to anything meaningful or tangible, the weak agreement that has been signed could place a legally binding deal in serious jeopardy. When world leaders were gathered at the summit on Friday to ‘sign’ on the dotted line, in fact they were thrashing out a weaker international consensus which merely capped global temperature rise by 2 degrees and agreed remuneration packages and aid for countries who face the immediate onslaught of climate change. Here’s the Channel 4 news coverage from last night. Keep watching as the live interview between Ed Miliband and George Monbiot is particularly compelling – it starts just before the 4 minute mark. Crucially, no date was set for a peak in carbon emissions, no date was set for any of it to become legally binding, nor were any international emissions targets defined. However much activism and pressure was placed upon world leaders to reach a deal, could we really have expected anything more in just two weeks? Gordon Brown and Ed Miliband are now insistent that the procedural process for the talks must change, as negotiations involving 193 separate countries made for a diplomatic nightmare. They say that some of the smaller nations were effectively holding the whole summit to ransom, as talks stalled last week for hours at a time when smaller countries threw their toys out of the pram over the developed world not taking enough responsibility for their historical carbon emissions. This meant hours of precious negotiating was wasted and talks had to continue until well after midnight on a number of occasions to make up for lost time. It was also probably part of the reason why a hurried and weaker agreement was signed in the dying moments of the conference so that the fortnight’s talks were not deemed as a total failure. This certainly needs to be addressed in time for next years summit in Mexico, as although it is commendable that the UN ensures every nation has its chance to speak, this is evidently not the forum in which such a discussion should take place. How can a fortnight’s worth of negotiating be enough to hear each and every one of the 193 countries represented, with over 25,000 delegates in attendance, with such an emotive issue on the negotiating table? This can be demonstrated by last-minute comments made by the Sudanese delegate Lumumba Di-Aping, who likened the final accord to the Holocaust. This was quickly denounced by European leaders and however inappropriate it shows the frustrations of the G77 and developing world that the richer nations could not get together to agree lasting targets based upon their previous behaviour. Last week saw Carwyn Jones on behalf of the Welsh Assembly pledge to help the Mbale region of Uganda prepare for climate change, but unfortunately this is small fry on such an international stage. Such measures should be adopted by other larger developed nations rather than keeping their own interests top priority. This is only demonstrated by China, America, South Africa, India and Brazil breaking away from the main talks to forge a watered down strategy that better suited their economies rather than the environment or consideration of the most vulnerable of nations. So what will happen now? Well it’s important that international momentum does not falter in the hangover of the conference, although this looks bound to happen. Also, does achieving this ‘weak’ agreement stand in the way of further definition of a legally binding political treaty? With talk of countries making voluntary targets, it’s no wonder the developing nations kicked up so much of a stink in the first week of the summit that the Kyoto agreement should still stand. Just because COP15 is over, it does not remove the obvious challenges we face with Climate Change. World leaders seem to have sidestepped the main issues and chosen short-term gain over long-term probability. It is now back in the hands of NGO’s, International Environment groups and campaigners to lobby world leaders to pull their proverbial fingers out, as there certainly is no planet b. Right well I’ve been speaking about the build up a fair bit but have yet to actually talk about what is going on at COP15. It seems the jargon busters are at work and negotiations are truly in full swing, and the enormity of what needs to be agreed is becoming apparent. The BBC World Service have created this interesting article on where every country stands in relation to its Carbon emissions and future carbon planning, which contextualises what needs to happen in Denmark. Despite pledges to the tune of £1.2 billion being made by Gordon Brown to help developing nations adapt to climatic changes, it appears that reaching a singular global deal, or text, is looking difficult. Poorer nations feel that they should not have to reduce their carbon emissions and it should only be those who were part of the previous Kyoto protocol who should make massive reductions. There has also been controversy with yet more leaked documents, this time the draft Danish text setting out their plan B if negotiations don’t go according to plan. With regard to last weeks ‘ClimateGate’ debacle, it was interesting this week when the Met Office announced that the last decade has been the hottest on record. That certainly should douse the spurious claims of climate change deniers that there is no such thing as global warming. And not only that, but next year is also predicted to being the hottest year yet experienced in modern history. Alongside this new research which seems has been perfectly timed to counter the leaked emails from the University of East Anglia, the Met Office have also produced some stark projections for what will happen if global temperatures were to rise by 2 degrees and then 4 degrees centigrade. So what will week two of the summit bring? Well the leaked draft text is part of the way there but what is looking like a two tier agreement will only exacerbate the disparity between rich and poor. 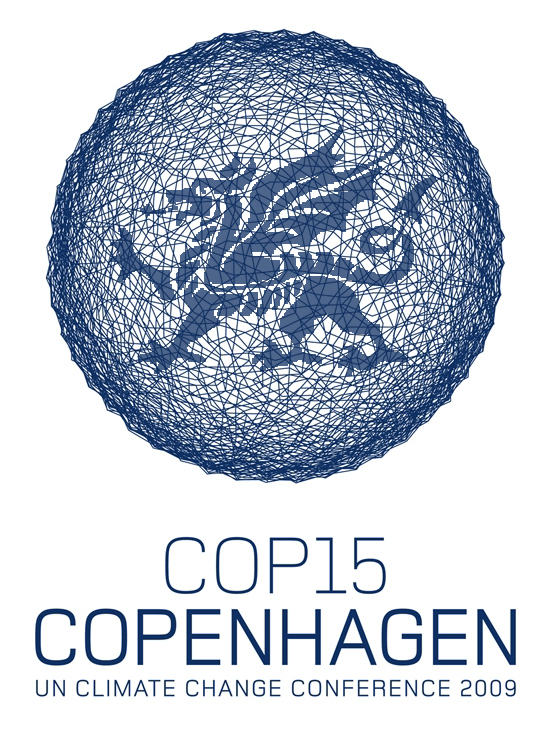 With Environment Minster Jane Davidson and new First Minister Carwyn Jones in Copenhagen rubbing shoulders with their international counterparts, can they persuade other larger nations to take Wales’ lead with the ambitious carbon reduction targets set out by the Welsh Assembly? As more ideas are thrashed out WGD will try to get in touch with some people who are in Copenhagen and see if they can give an insight into what is happening first hand. An effective bilingual advertising campaign, created by Golley Slater, has been launched by Waste Awareness Wales in order to meet an ambitious new target of 70% recycling for all household waste by 2025. Failing to recycle will soon start to cost us all money. There is a need to meet strict European targets and failing these will result in the taxpayer having to pay more. Waste Awareness Wales are using children in this television advert, currently being run across ITV1 Wales and S4C, to combat our ‘throw away’ society. Waste Awareness Wales launched this TV advert on November 16 to promote basic recycling tasks. The advert features small children who are trying to perform the basic tasks of recycling newspapers, cans, plastic and food waste but they are unable to do so without adult help. The TV campaign will run until January across ITV1 Wales and S4C and will be supported by radio. The second phase of the advert will run February until the end of March.The Welsh Assembly Government has funded Waste Awareness Wales since 2002 to provide official information to the public about managing materials and resources more sustainably, and reducing waste. Friends of the Earth offer some great tips for recycling. It was the perfect photo call; 30 primary school children, climate change campaigners and a 30 ft long chinese style monster. 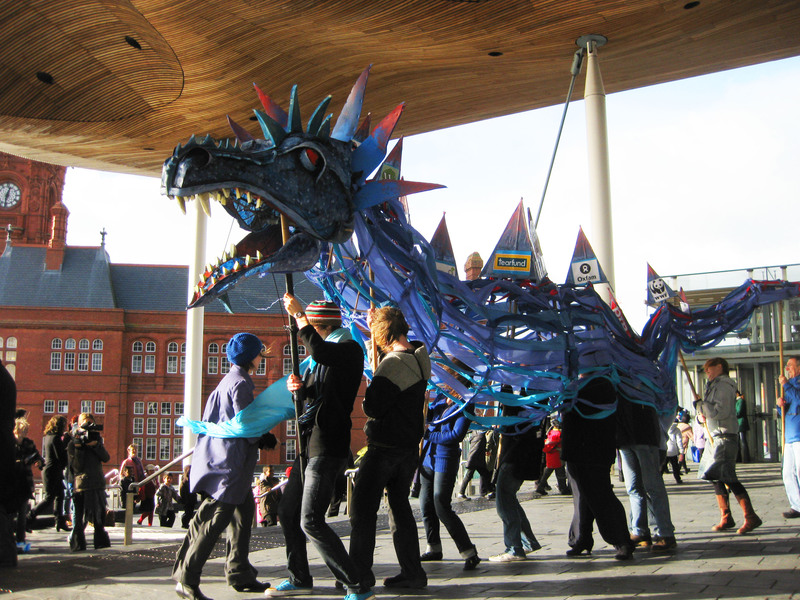 Dai the blue dragon is embarking on an international journey of over 1000 miles as he heads for the Copenhagen climate change summit to represent the environmental wishes of the people of Wales. Hopes are running high for a politically binding treaty being signed at the two-week summit which begins on the December 7. There has been much speculation concerning whether or not it will be a political fudge, but with the news that President Obama will be now be in attendance, and China seemingly on board, a deal may not be as far away as once seemed. On a rather blustery Wednesday lunchtime, campaigners from the Stop Climate Chaos Cymru coalition presented Dai for the first time on the slate steps of the National Assembly. All this in the hope that Assembly Members would come outside to show their support and add a travel label to Dai’s torso which will carry their messages on his gruelling journey to Denmark. Having started in Rhayader in Powys where he was created by Russell Kirk from the CARAD community group, Dai will be stopping off at ‘The Wave‘ demonstration in London on December 5, before heading over sea and land in time for the summit. 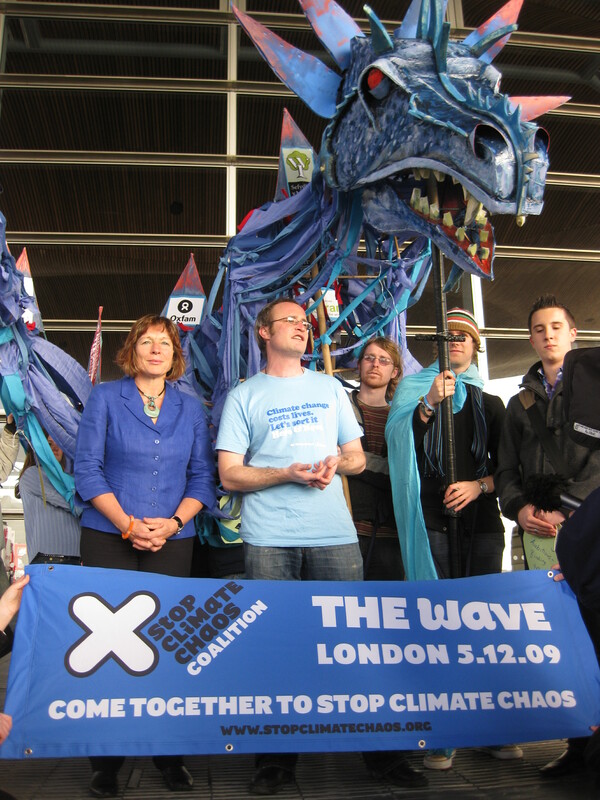 The Stop Climate Chaos Cymru coalition is made up of representatives from RSPB Cymru, WWF Cymru, Friends of the Earth, Oxfam Cymru, Christian Aid, Cafod, Sustrans and the National Federation of Women’s Institutes. 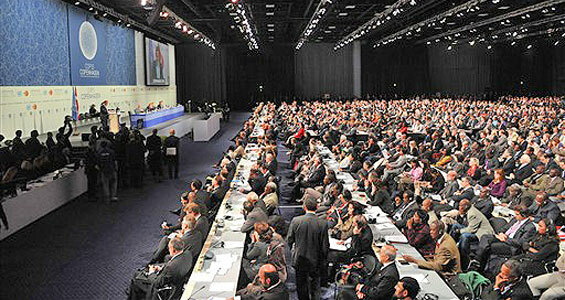 They are all expecting a global deal in reducing carbon emissions that threaten our climate. In order to prevent a rise in global temperature of two degrees centigrade, developed nations must commit to at least a 40 per cent reduction of emissions by 2020. Wales has already committed itself to this target, but the Stop Climate Chaos coalition are lobbying the Welsh Assembly Government to ensure that other nations follow suit. To set the agenda, Julian Rosser who is chair of the Stop Climate Chaos Cymru group, voiced the coalition’s wish list for Environment Minister Jane Davidson to bear in mind on her trip to Copenhagen. The minister then countered his statement with that of her own. 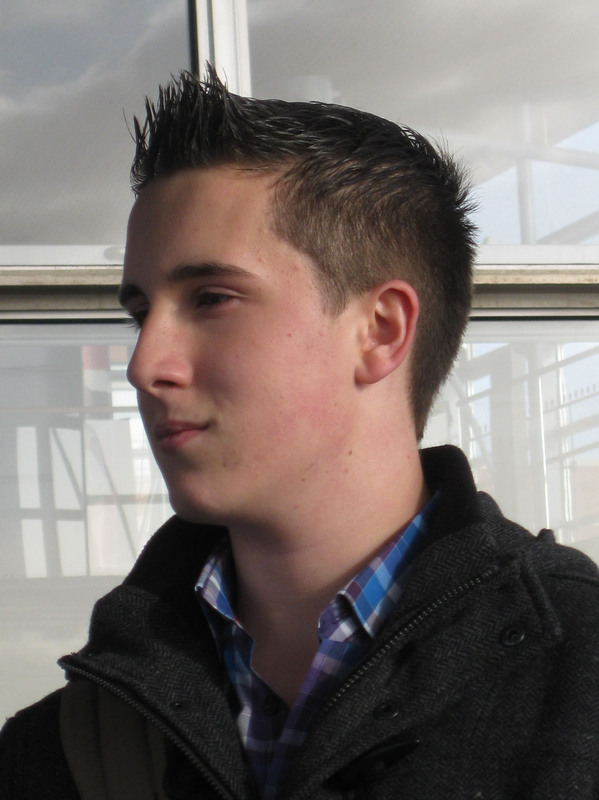 Accompanying the minister to Copenhagen will be 16-year-old Cerith Rhys Jones from Cwmgors, north of Swansea. He has been the Welsh Assembly’s Climate Change Champion since January and attends events and visits schools as a ‘green ambassador’. He told me how important it is for young people to realise that they too have a voice and can do their bit to combat climate change. He’ll be blogging his way through the summit day by day to keep us informed on how Wales’ voice will be heard on the International Stage, which you can check out here. When I was down at the Senedd in Cardiff Bay, I interviewed Cerith and Julian for the WGD podcast. 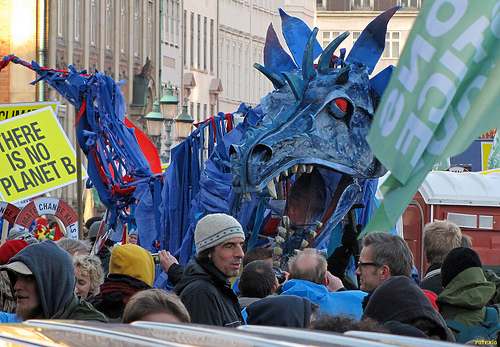 With everything still to play for, the next few weeks will see thousands of people descend upon London alongside Dai the dragon to show their support to act on climate change. If you want to get involved, the Co-op has agreed to organise and subsidise transport from Cardiff to ‘The Wave’ on Saturday December 5. People can book online using a code from Oxfam or the Co-op. When you get the booking page it asks for The Co-op or Oxfam code – the code is OXFAM_TheWave. What do you think will happen in Copenhagen? Do you think they’ll sign a treaty and come to an international consensus for the future? Whatever the outcome, people in Wales are still being encouraged to do their bit. Luned Jones from Oxfam Cymru says that people shouldn’t be afraid of climate change and everyone can take small steps to minimise their carbon footprint. From changing travel habits, not using the dishwasher or tumble dryer or simply making sure the TV isn’t left on standby, we can help the environment as well as saving ourselves a penny or two. She told me that people in Wales need to realise that their lazy habits are having devastating effects on people in other parts of the world. What will come of the Copenhagen summit remains to be seen, but there are clearly plenty of people in Wales who are passionate that the forthcoming negotiations will be a success. How can we be more sustainable through going shopping? 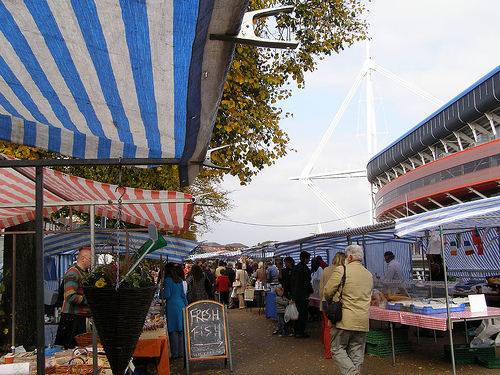 Head down to your local farmers market apparently – I braved some blustery conditions over the weekend down at Riverside Farmer’s market in Cardiff and this is what one shopper had to say about the experience. Eating more locally grown produce and reducing food waste were just two of the things spoken of at a debate that I went along to as part of Cardiff University’s sustainability week. In a question time styled debate, a panel including Environment Minister Jane Davidson, Dr Pam Robinson, School of Social Sciences (who knows her stuff about the supermarkets), and Professor Kevin Morgan (of an Urban and Regional governance background), fielded questions from a fully charged audience of academics and students. 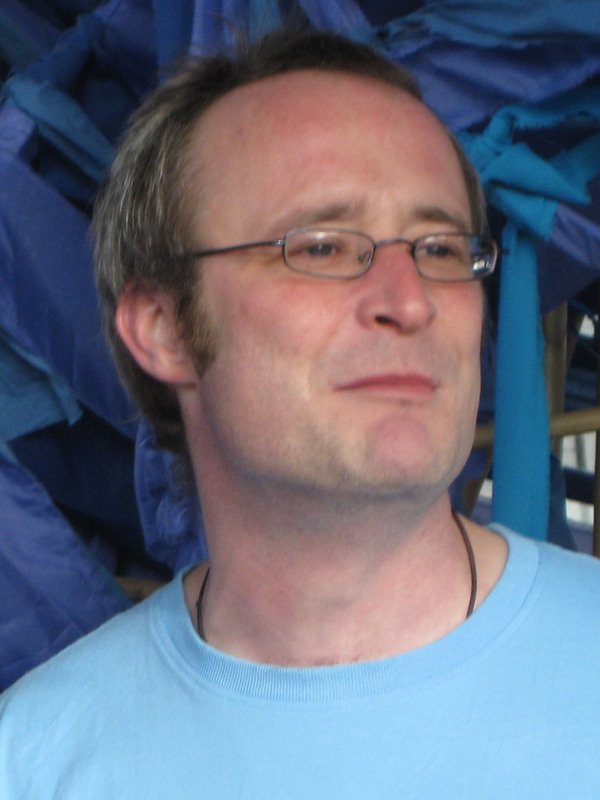 The most enigmatic of the bunch was Steve Garrett, who is the founder of the Riverside and Roath Farmers markets. Agriculture, farming and food production is one of the biggest contributors to global warming, and with populations set to rise food shortages will become a huge issue. A big question is, how can you ensure a level playing field when supermarkets have economies of scale on their side to drive down prices and squeeze a farmer’s profit margins ever lower? Remember the dairy price fixing allegations of the ‘big four’ by the Office of Fair Trading in 2008? Even then the OFT got its fingers burnt with claims of defamation, so the supermarkets certainly have some legal clout behind them. It’s inevitably about cultural change; how can people be persuaded it’s wrong to eat strawberries in December after accruing thousands of air miles to get to the fruit aisle? There are some good reasons why people should make a farmer’s market a higher priority for their weekly shop. There is a general misconception that farmers markets are for the bourgeoisie, and although there were stalls with specialist cheese’s and olives at riverside, you could still get all the staples. Also people fear that farmers markets just aren’t as cheap as the supermarkets, although that wasn’t according to the people i asked. With pros there usually always come a few cons though. So there are clearly things that a farmers market can’t do that the supermarkets can. Perhaps the answer is a mixture of the two, and this is something that was suggested at the debate. Anyway back to the point, what are the three key things people need to do eat more sustainably? Sounds simple. 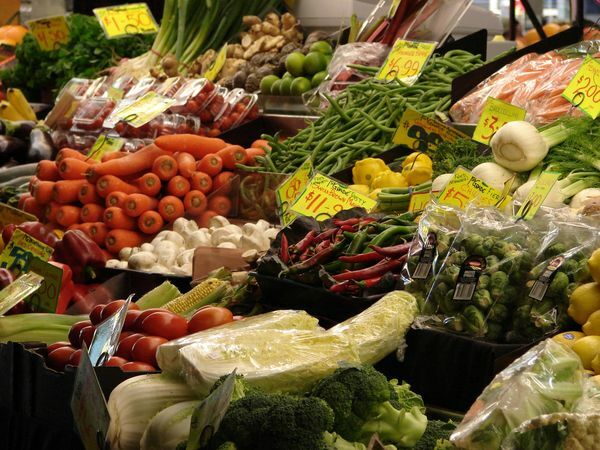 However, we’re struggling to get to grips with the thought of having to pay for plastic bags here in Wales, so the Welsh Assembly need to come up with something good to get people away from the supermarkets and out buying more locally produced food. Maybe they could even teach us how to grow our own! Well things are looking ever gloomier for a legally binding political treaty being signed at the UN Copenhagen Summit in 18 days time. With the US declaring they won’t be bringing any tangible targets to the negotiating table, people are starting to ask if there is much point to Copenhagen at all. A massive anticlimax is looming with Denmark stepping up to the plate to suggest delaying a legally binding treaty until 2010. Obama has said it’s too late to reach an agreement this year, and despite all the rhetoric it all seems the US is being as slippery as it always has been in defining how much to reduce their carbon emissions. 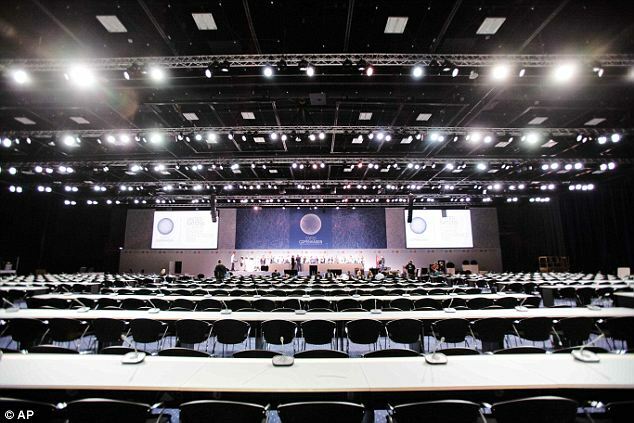 African nations were none too pleased at the prospect of a political fudge, and 55 developing nations walked out of the pre talks in Barcelona when cracks began to appear in who was going to shoulder the cost of the environmental disaster that is right on their doorstep. So theres the most recent global context, but how about a bit closer to home. On Tuesday the 10th I attended a panel meeting held by the National Assembly Sustainable Energy Group (or NASEG for short), discussing exactly how renewable energy in Wales could play a key part in reducing carbon emissions, but how that must be underpinned by massive cultural change. Hosted by an impressive panel of key stakeholders, academics and politicians including Jane Davidson (Minister for Environment Sustainability and Housing), Kevin Anderson (Director of the Tyndall Centre and Climate Change Commissioner) and Dr Calvin Jones (Economist Cardiff University Business School) many ideas were thrashed about the room, swinging violently from apocalyptic to inspirational. Collectively we have a massive task on our hands to reverse the warming effect that humans have upon the atmosphere, and alarmingly our behaviour and consumption must change rapidly in order to try and stem significant rises in global temperature. Dr Calvin Jones, who’s self confessed to being one of the few economists he knows that doesn’t believe in traditional economic growth, thinks we have a long way to go until an international consensus can be made. As the western world has impressed upon developing nations for the last 60 years that a materialistic and capitalist economic growth model is the way forward, we have a huge diplomatic challenge on our hands. It will be pretty hard for countries currently experiencing unparalleled economic growth, like China and India, to stomach when we turn around and forbid them to slash and burn as we have done to get where we are today. Very much a case of ‘Do as we say, not as we have done’ it seems. We’re in dire need to completely overhaul our attitude to consumption, travel and our throwaway culture. In Wales we are currently consume 2.7 planets worth of resources, by 2020 that will be 3.3 planets worth if we continue to consume as we do now, according to the One Wales : One Planet report from a year ago. To be fair, Wales has been in the right frame of mind for a while. The NASEG event threw up some interesting debate. Is there a role for Nuclear Energy in Wales? How can Ffos-y-fran be justified when as yet there is no such thing as ‘clean coal’ or carbon capture technology? Could people be given individual annual carbon allowances and taxed accordingly to limit their emissions, or is this too draconian and should conscientious behaviour be incentivised instead? What is clear is that out of any other nation in the UK, Wales is perfectly poised to take advantage of pretty much any renewable technology available, be that wind, tidal, hydro-electric, biofuel development or biomass. At a separate event as part of Cardiff University’s Sustainability Week that I went to last night (another post to follow), Jane Davidson who was again on the panel arrived fashionably late. 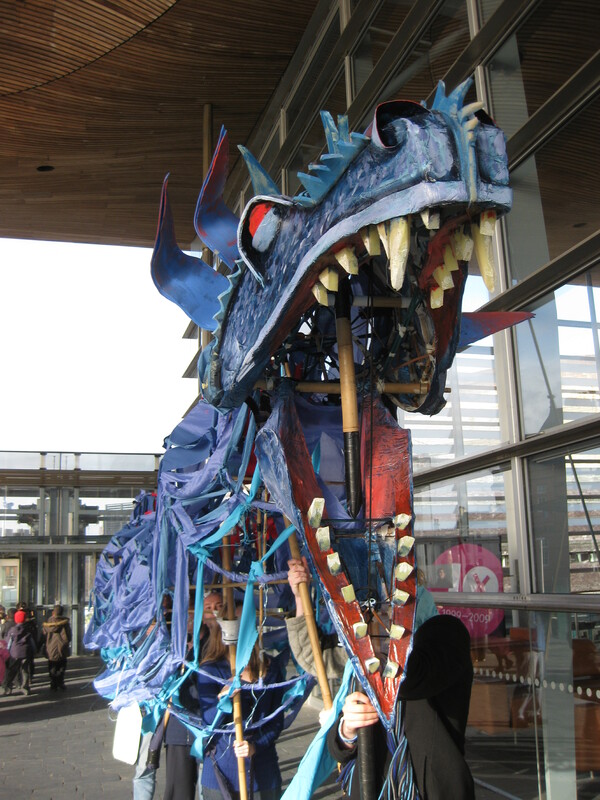 However it seems for good reason, with news hot from the Senedd that the Welsh Assembly have just agreed to aim for a target of 40% reduction in Carbon emissions by 2020. If only the other nations could be more decisive in time for Copenhagen, thats if it’s not all hot air – no one wants anymore of that.